Stromberg has the largest selection of medallion designs that you’ll find anywhere. Choose from their stock designs or have them create one that’s uniquely your own. As an architectural ornament, GFRC medallions by Stromberg are an awe-inspiring addition to any room. 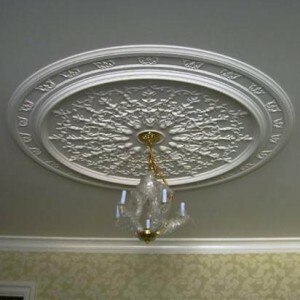 To finish a dome, a chandelier or a building façade, Stromberg medallions are the way to go. For over 30 years, Stromberg has been in the business of manufacturing these amazing design elements; from traditional to modern in style. 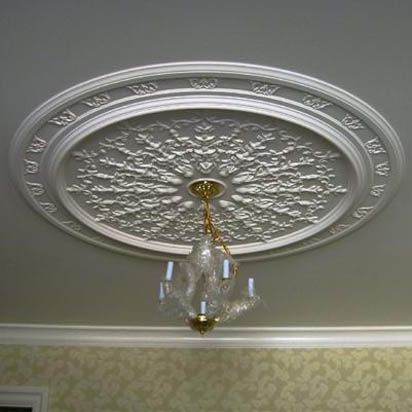 Applying their expert craftsmanship to the advanced technology of today’s GFRC, Stromberg can create medallions that will complement any component of décor in your home or place of business. Medallion designs in glass fiber reinforced concrete are varied in design, from intricate to simple and understated. Adding a GFRC medallion to your home can make just as much of a statement as the furniture you choose. Stromberg’s collection of ceiling medallions can meet all your design needs; they have styles in different finishes, textures and colors. From historically correct reproductions of palace decor to minimally simple designs, their assortment will give you design flexibility. They also have some medallions that are reproductions of classical historical examples. Stromberg’s collection of GFRC medallions is second to none, and because GFRC is easily molded and shaped you can choose any design you want. The resulting finish is smooth and without voids. GFRC has a very high tensile strength because it’s reinforced with fiberglass. It doesn’t need any extra reinforcement, which means that complex shapes are easily made. Glass Fiber Reinforced Concrete can be as much as 75% lighter than medallions cast with traditional concrete, making it easier and quicker to install. As pioneers of GFRC, Stromberg uses unique methods of detailing, manufacturing and installation of your medallion; they’ll help you make your project a success. GFRC allows for beauty, practicality, durability and value. It’s lightweight, easy to mold and a cost-effective choice. A medallion for every room, finished and ready for installation, it’s a fashionable and valuable addition to your décor. The professionals at Stromberg Architectural Products will partner with you throughout the entire process to ensure your GFRC medallion(s) meet your expectations. Stromberg is here to help with CAD details, design assistance and specifications. Contact them today at 903-454-0904 for your free custom quote, and put their 30 years of experience to work for you.